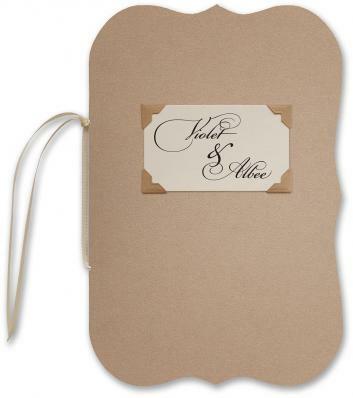 The Sand StoryBook RSVP set includes the petite A1 champagne pearlescent envelope and matching RSVP card. RSVP card in Champagne pearlescent cardstock measures 5x3.5 inches. Papers for both the RSVP card and envelope come from Italy. If you print, the rsvp card comes 4 to a sheet, so you print and cut. If we print, we cut to 5x3.5 inches. Templates for both parts comes with the kit. StoryBook : Sand Booklet Wedding Invitations. Charming + Chic, totally unique and novel, this booklet designed wedding invitation is ready for your story. The cover is made from stylish taupe colored Italian pearlescent paper. Sweet! Diecut Taupe cover opens to 2 page diecut invitation sheet. Lots of room for story telling. This is a larger format, fits in an A8 matching champagne envelope. Both the cover and the interior sheet are diecut, with holes cut in both, for easy assembly. You mount your title label using vintage cut kraft photocorners. The rsvp set is mounted on the inside, back cover. You can completely customize this style with artwork on the covers and the invitation. Ready for your creativity! True DIY ease. DOUBLE ENVELOPE AVAILABLE : 50 CENTS EXTRA CHARGE. Cover of Booklet is diecut in Vintage shape, with holes for ribbon. Invitation Sheet: Diecut and scored printable invitation sheet of champagne pearlescent 70 lb paper. Booklet Cover:Heavy tuape pearlescent Italian cardstock, diecut and scored. Invitation Sheet:Diecut and scored pearlescent invitation sheet. Diecut holes line up with the cover diecut holes. Mailing Envelope:A8 champagne pearlescent envelope with square flap. Italian paper. Tools:Templates in Microsoft Word if you plan to print these yourself.